There are 195.9 million people who are undernourished in India. Despite sufficient food production and tremendous economic growth, we are yet to address the challenge of eliminating hunger in India. "India is committed to inclusive growth and we cannot take pride in inclusive growth if we cannot eliminate hunger. We have enough surplus food, enough capacity to grow more food; at the same time many of our people in the country go hungry due to inadequate logistics, information, knowledge, and delivery systems. In eliminating hunger, Information Communication Technology Infrastructure (ICT) can play a significant role. It is time to really use technology in a very different way to handle problems related to hunger and food waste. Expertise from many countries related to logistics, information technology, management, organizations, and structures can contribute a lot towards eradication of hunger and food waste from India. We can collectively go out to the nation and say that we will indeed eliminate hunger in India together by 2030 highlighting that the tools that we have today provides the opportunity of even more hope than ever before. The growth we look for should result in inclusive growth and growth for the people at the bottom of the pyramid and must eliminate hunger for millions of the people in our country. I invite all to work together for the India Food Banking Network with a hope to begin this journey together and help eradicate hunger in India by 2030. There is a need to have a food bank in each district. IFBN is not being highlighted as the only solution, but the idea is to have many people participating and joining hands in different ways." Develop partnerships for procurement of funds and food. Create Food Banks in India in communities to systematically capture and distribute food to reduce hunger and malnutrition. Support and strengthen Food Banks by connecting Food Banks to resources of food. Help Food Banks develop efficient processes and safety processes in the collection and distribution of food. Develop and implement efficient monitoring and evaluation mechanisms to ensure effective, transparent and equity-inclusive delivery to reach the most vulnerable population. Promote Food Banks to emerge as community spaces addressing various issues of nutrition, health, hygiene, food waste and development. Promote decentralized, flexible and community based locally responsive strategies and models. Undertake advocacy among various stakeholders to encourage greater involvement. Teamwork: We are committed to working collaboratively with our Board, staff, members and partners across the hunger relief network. Transparency: We conduct our activities by being open and accessible to strengthen our network and maintain the trust of our stakeholders and the public. Integrity: We achieve our goals by maintaining the highest degree of ethical standards and by putting our values into action. Accountability: We are focused on outcomes. We value results and measure our performance against precise goals; we take ownership and responsibility for doing what we say we will do. Volunteerism: We encourage volunteers to contribute their time and skills to the cause of hunger. Food Security Foundation India under its flagship programme - India FoodBanking Network (IFBN) addresses the issues of hunger through a network of FoodBanks. We have a vision to eliminate hunger in India by 2030 by establishing a strong and efficient network of FoodBanks throughout the country, so that every district has access to at least one FoodBank. India FoodBanking Network (IFBN) is bringing together the government, private sector, and NGOs to fight hunger and malnutrition in the country. IFBN is establishing a network of transformational FoodBanks to systematically capture food from donors and channelize it to the institutional feeding programs. The network is a multi-stakeholder partnership of corporate sector, government, leading development agencies, and local communities who partner and contribute to sustain the food banking movement in India. IFBN thus acts as a platform for aggregation and effective deployment of India’s existing resources of food, funds, infrastructure, technology, spirit of volunteerism and culture of feeding to address the problem of hunger. In addition to supporting feeding institutions and strengthening delivery systems, IFBN is also looking at facilitating regulatory changes to create an environment conducive to giving food. Excess packaged food and grains on the shelves and warehouses of food industry is worth millions. But good quality food is wasted and thrown away because of short remaining shelf life. India Food Banking Network offers a food management solution for excess food inventory and helps food businesses to timely save this surplus food products to feed those in need. IFBN recovers this surplus inventory of good quality packaged food from food industry and delivers it safely to Not for Profit organisations to feed those in need within the best before date of the products. “IFBN connects surplus inventory of packaged food and grains from food companies to feed those in need, especially children. This saves food and resources that went into production of food from going waste. It also frees up valuable warehousing space and saves financial and environmental costs of disposal for the food companies. Adequate food and nutrition is the foundation for a healthy and productive life and the basic pre-requisite for all other interventions in the areas of health, education and skill building. IFBN is therefore also helping corporates to prioritize food security and nutrition and to use the resources earmarked for CSR initiatives to fund nutritious meals to children in schools. The donations are eligible for tax benefits under Section 80 G of the Income Tax Act. India Food Banking Network is committed to creating a strong and efficient network of FoodBanks across the country. 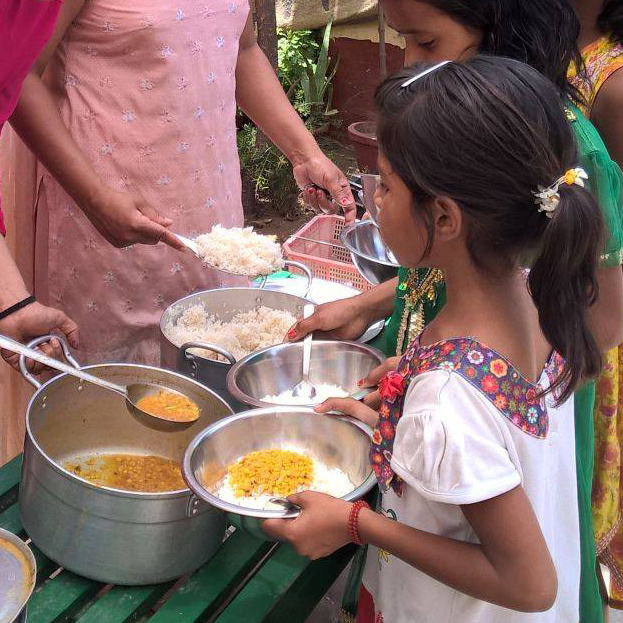 India Food Banking Network with its 10 FoodBanks, over 100 NGO partners and more than 25 corporate partners is serving over million meals every year to alleviate hunger in India. We are leveraging the existing network of local NGOs, corporate CSR resources and our operational expertise to swiftly move funds and food to targeted beneficiaries in a sustained way. This multi-stakeholder partnership ensures large scale impact on hunger and malnutrition. This supports and strengthens the ecosystem for the implementation of other development programs such as livelihoods, women’s empowerment, education and skill development to break the viscous cycle of undernourishment and poverty. Food fortification or enrichment is the process of adding micronutrients (essential trace elements and vitamins) to food. Hidden hunger which involves vitamins and micro nutrient deficiencies is widespread and of great concern in India. Iron, Folic Acid, Vitamin B12, Vitamin A and D can be delivered through fortified foods.Going forward, India Food Banking Network is working to put together a Fortification Project to deliver nutrition on scale through its large network of partner organizations. Food safety and quality is at the core of Foodbanking operations. India Food Banking Network ensures that all the partner organisations in the network adhere to the standard operating procedures to ensure the quality of food being distributed to the beneficiaries. The entire supply chain is sensitive to any leakage, misuse, lax in safety and quality standards. All the stakeholders/partners are committed to maintaining full transparency and integrity while working together for managing food waste and distribution of surplus food to those in need and implementation of food and nutrition programs such as School Meals Programs.